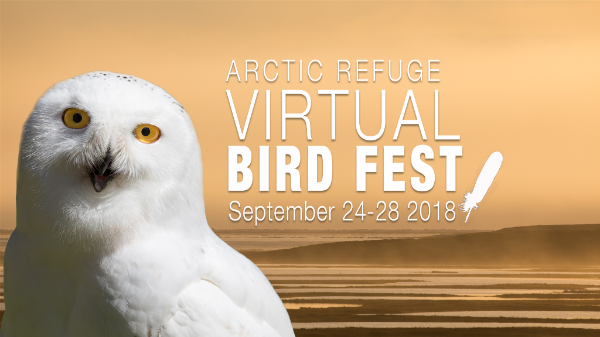 The first ever Arctic Refuge Virtual Bird Festival took flight during the last week of September – a digital celebration of migratory marvels in the far north. Every summer, thousands of birds travel from around the world to nest and raise their young in Arctic National Wildlife Refuge. By fall, they are on the move again. Maybe you’ve seen them pass through your backyard pond or stop over on your local beach – they connect us all as they move along all five flyways. Yet few have witnessed the summer bloom of life that happens in the far Arctic tundra during the short summer season. The virtual festival brought this northern nursery to an online audience through photos, video, activities, and stories from several different organizations. US Fish and Wildlife Service partnered with the Friends of Alaska National Wildlife Refuges, Audubon Alaska, Manomet, and Alaska Geographic to share content across many social media platforms at the local, regional, and national level. Festival participants “met” by responding to an event page on the Arctic Refuge Facebook account: more than 650 attended via the event page, and the 68 event posts reached almost 18,000 people. Partners also took to Twitter, Instagram, Steller Stories, and Medium, with engaging and educational stories of birds, science, and the refuge.